As life’s pressure increases we find it more and more difficult to relax or focus. We might find relief in sport, a calming cup of tea, going for a walk, massage or yoga. What if I told you there was a simple tool which could help you de-stress, meditate, focus and sleep? A tool which can assist creativity and pain relief – and all you’d need to use it is a pair of headphones. By simply plugging into a computer or smartphone and pressing play, you can drift off to a realm of peace. It’s called binaural beats, or brainwave entrainment, and it helps your brain to go into a particular state of mind very quickly. 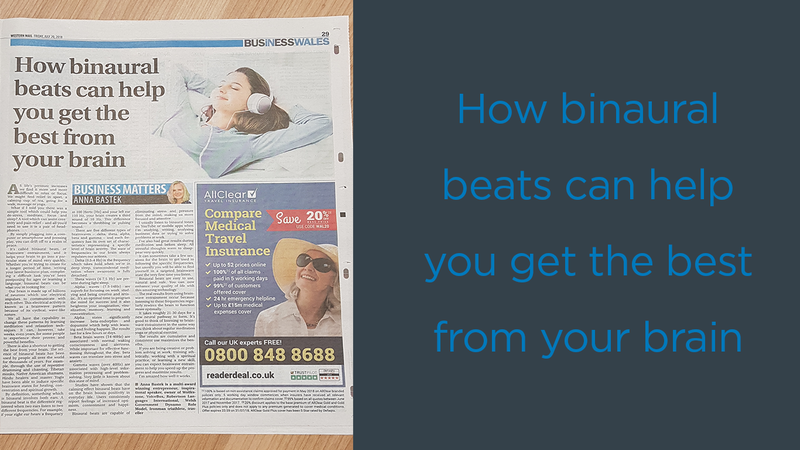 Whether you’re trying to create for a longer period of time, writing your latest business plan, completing a difficult task you’ve been postponing for ages or learning a language, binaural beats can be what you’re looking for. Our brain is made up of billions of neurons which use electrical impulses to communicate with each other. This electrical activity is known as a brainwave pattern because of its cyclical, wave-like nature. We all have the capability to change these patterns by learning meditation and relaxation techniques. It can, however, take weeks, even years, for some people to experience their proven and powerful benefits. There is also a shortcut to getting the best from your brain. The science of binaural beats has been used by people all over the world for thousands of years. For example, through the use of repetitive drumming and chanting, Tibetan monks, Native American shamans, Hindu healers and master Yogis have been able to induce specific brainwave states for healing, concentration and spiritual growth. By definition, something which is binaural involves both ears. A binaural beat is the difference registered when two ears listen to two different frequencies. For example, if your right ear hears a frequency at 100 Hertz (Hz) and your left ear 110 Hz, your brain creates a third sound of 10 Hz. This difference becomes a throbbing or pulsing sound. There are five different types of brainwaves – delta, theta, alpha, beta and gamma – and each frequency has its own set of characteristics representing a specific level of brain activity. The state of frequencies in our brain always regulates our actions. Delta (0.5-4 Hz) is the frequency which takes hold when we’re in deep sleep, transcendental meditation where awareness is fully detached. Theta waves (4-7.5 Hz) are present during light sleep. Alpha waves (7.5-14Hz) are superb for focusing on work, studying and being creative and artistic. It’s an optimal time to program the mind for success and it also heightens your imagination, visualization, memory, learning and concentration. Alpha states significantly increase beta-endorphin and dopamine which help with learning and feeling happier. The results last for a few hours or days. Beta brain waves (14-40Hz) are associated with normal waking consciousness and alertness. While important for effective functioning throughout the day, beta waves can translate into stress and anxiety. Gamma waves (over 40Hz) are associated with high-level information processing and problem-solving. Very little is known about this state of mind. Studies have shown that the calming effect binaural beats have on the brain boosts positivity in everyday life. Users consistently report feelings of increased optimism, contentment and happiness. Binaural beats are capable of eliminating stress and pressure from the mind, making us more focused and attentive. I usually listen to binaural tones on YouTube or mobile apps when I’m studying, writing, analysing business data or trying to solve problems at work. I’ve also had great results during meditation and before sleep. All stressful thoughts seem to disappear very quickly. It can sometimes take a few sessions for the brain to get used to following the specific frequencies, but usually you will be able to find yourself in a targeted brainwave state the very first time you listen. Binaural beats are easy to use, natural and safe. You can now enhance your quality of life with this amazing technology. The real results from using brainwave entrainment occur because listening to these frequencies regularly rewires the brain to function more optimally. It takes roughly 21-30 days for a new neural pathway to form. It’s good to think of listening to brainwave entrainment in the same way you think about regular meditation yoga or physical exercise. The results are cumulative and consistent use maximizes the benefits. If you are being creative or problem solving at work, training athletically, working with a spiritual practice, or learning a new skill, you can expect brainwave entrainment to help you speed up the progress and maximize results. I’m amazed how well it works for me.